Tackling the forbidden, the exposed, the vulnerable and the Divine feminine this is a colorful piece you want to see. Naomi was born in Athens, Greece. Her mother Penny Poole, a Canadian journalist, and her father Rafael Guzman, a Venezuelan metal artist, brought her to Ontario, Canada in 1987. At a young age, she demonstrated passion and wisdom for social issues. She experimented with alternative media by publishing a monthly periodical at the age of 16. And at 17, she produced fundraising videos for two organizations. 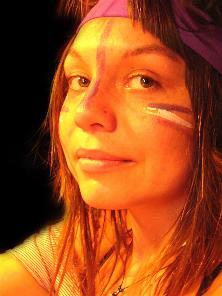 Naomi is a Doula, Dance Facilitator, Yoga teacher & Trained Mediator. She has had a love for art, dance and movement her entire life, and having only just experienced its potential as a healing modality in recent years, she is inspired to hold space for people to journey into their spirit and go deep into the body; to be in discovery. A published Childrens’ Author, documentary film maker, and Artist, Naomi served as Assistant Director for Peace Diviners International; an International NGO supporting grassroots social change initiatives using artistic creative mediums. Served on the board of the Ecclesiax art gallery for 2 years. Practiced Art therapy for people with disabilities through the City of Ottawa As well as Co-founded the Umi Cafe. Spending the last five years working fairly intensively with Medicine people in South and North America she has a deep love for the earth that she carries with her in all her work as she holds people in the womb. Until recently, for her day job Naomi worked with children at a Holistic Daycare center she started in 2009. She is now recently a fantastic mother of a beautiful young child, Raven. This multi talented artist has been performing theatre as well as making art from the tender age of 5. Starting off her career as a ballet dancer from the age of 3, she was quickly introduced to the world of theatre, dance and art. 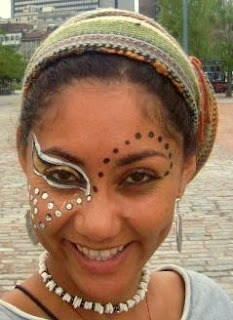 Jacqui is from South Africa and has studied at the University of Cape Town where she obtained her B.A degree in Theater. She has starred in numerous performances across the world, in festivals as well as on stage and on the street.She has also starred in South African local television series as well as commecials and films. She has also worked with an African Circus company, as a dancer and acrobat. Now residing in Ottawa with her 16 month year of daughter and Life partner. She is looking forward to collaborating with the Niyamah Collective and expressing her views on life as she has experienced so far. As well as to share stories with and about woman across the world. A True artist willing to explore through whatever medium she can find. Dance, theatre and music as well as painting and sculpting, Heather tells her story. A powerful Singer Song writer, Heathers main form of expression is through her Music. 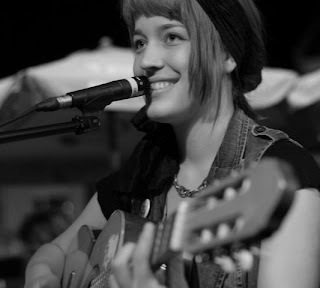 Her voice unique and strong, she explores herself through her songs and the strum of her guitar. She has performed throughout Canada in cities such as Vancouver, Ottawa and Toronto. Gaining inspiration from her travels, whether it be from Central America, or Lanark, she knows how to tell a story. Currently she is the beautiful mother of a little one year old willow. 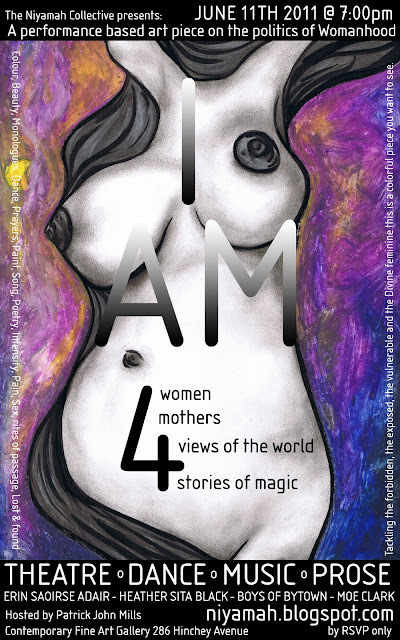 Heather is excited to be writing and performing a dramatic theatrical piece for the upcoming show I AM.